Have you ever wondered are we really alone in the Uni verse? Is life on Earth so special, that we are the only civilization in the Cosmos? Humanity has been speculating about life on the Red Planet Mars for more than 100 years now. People thought that green creatures live there. Today we know that that’s not true, but we wonder if life has ever been present on Mars. We want answers to one of the greatest scientific questions that Humans are asking i.e. was there ever life on Mars? We, now, live in the 21st century and the level of our technology reaches the limits of the extraordinary! This is the story of the Mars Science Laboratory that landed on Mars in the evening of Aug. 5, 2012 and started a new era in planetary exploration, inspired a lot of people about the future and changed our understanding of the Red Planet. This is the story of the amazing rover Curiosity that is still standing strong on Martian soil as of early 2014. MSL wasn’t famous back in 2002 when everything was s till on the design table. One year before the Mars Exploration Rovers (MER) Spirit and Opportunity launched, NASA started designs of a next generation mega rover that would be far larger than anything dreamed of before. Using a bold and audacious landing system, never before tested in space, and with a set of instruments and sensors that would be the equivalent of a human geologist on Mars, NASA set itself for the biggest challenge to date – to land a one ton rover on the Red Planet. 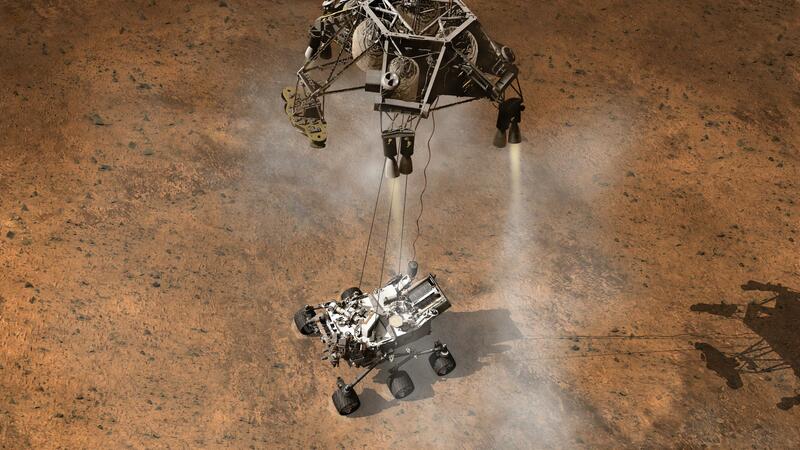 So, why do we need to send rovers to Mars and to spend billions on planetary exploration? Well, human curiosity is a powerful driving force. 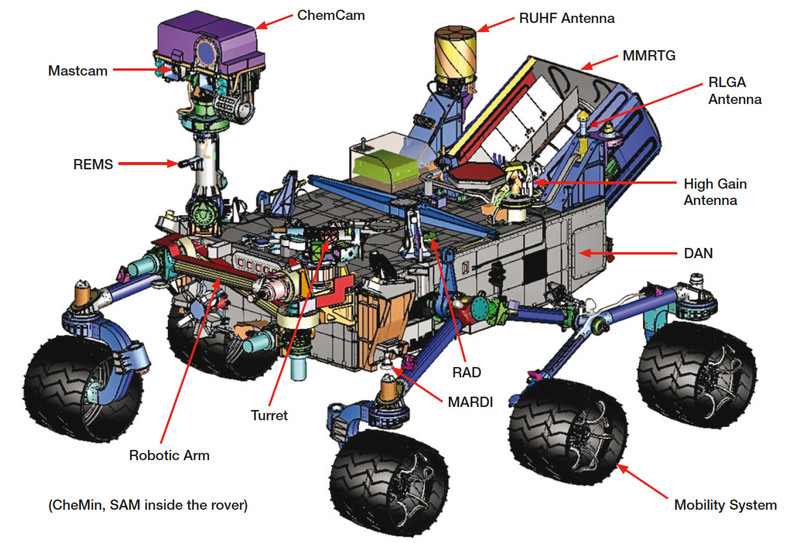 The name of the rover was named after our aspiration to the unknown – Curiosity! We need to know, we need to explore. This is in our spec ies’ blood, this is who we are. We have reached the point in our civilization’s development where we turn to the stars and look for others like us. Curiosity was sent to Mars with the primary objective to see if there was ever a habitable environment on the planet. What does a habitable environment mean? It means the existence of three very essential things for a long time in one place – these are benign water in liquid form, a source of energy and carbon! To find out carbon and water on Mars is no easy task, but this rover is packed with an array of science instruments, 17 cameras that are our eyes on Mars, a laser that zaps and evaporates rocks to unde rstand what they are made of, a giant human-like arm that drills into the Martian surface and an on board in-situ laboratory that can tell you exactly what elements and how much of each you have in a drill sample delivered by the arm, and all these powered by a nuclear generator! Please, stop reading and imagine this! Humans have put a giant beast of a rover, that weighs 900 kg and is powered by a nuclear generator on Mars and this machine has an entire laboratory inside of it! We have sent several instruments with the MERs before, but this is an entirely different realm! You take something that you think you understand and you decide to make it 10 times bigger. Now you are asking for a challenge! This rover is as big as a mini cooper! 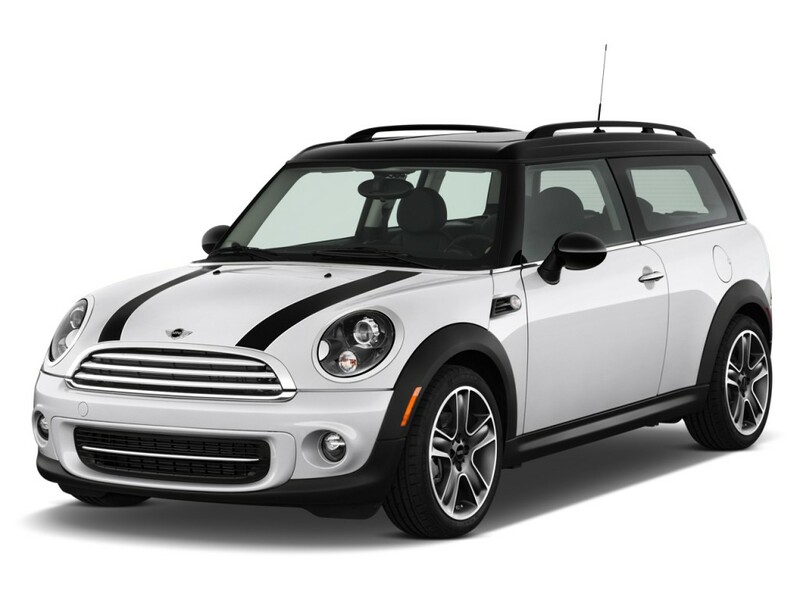 Next time you see a mini cooper on the street, stop, look at it and remind yourself that we have one as big as that on Mars! 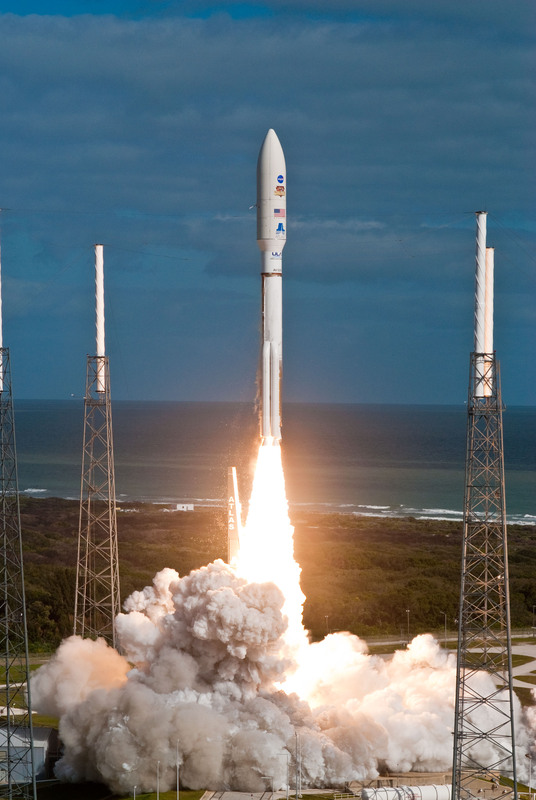 The plan for MSL was to launch on an Atlas V rocke t during a window lasting from Nov. 25 to Dec. 18, 2011, with arrival at Mars in the period Aug. 6-20, 2012. 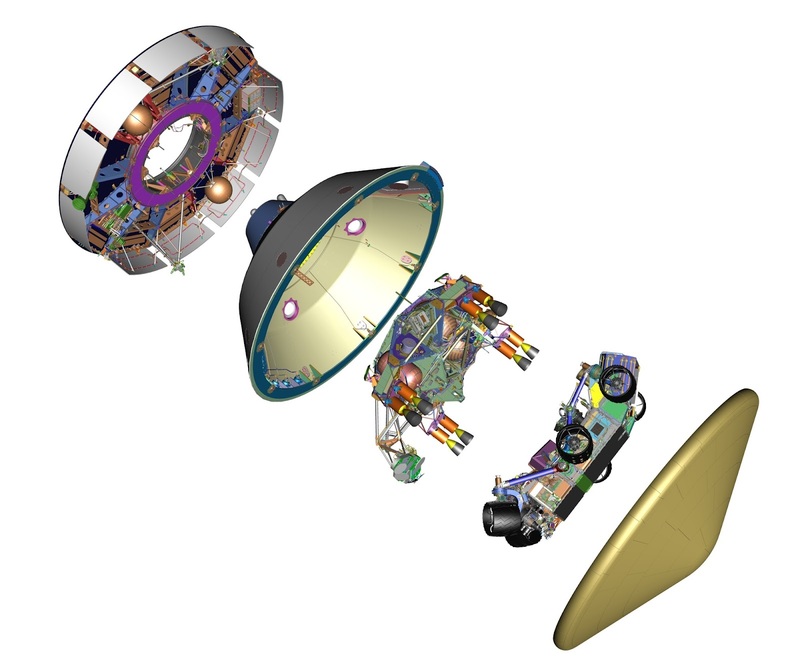 MSL would be supported by a cruise stage between injection and arrival at Mars for communications, data transfer and trajectory correction manoeuvrings. The rover would land during the summer with the mission designed to last one full Martian year – 669 Sols. A Sol is a Martian day that is around 40mins. longer than our Earth days. A key feature of MSL was the guided pinpoint descent, which allows the engineers to land the rover on places on Mars, considered dangerous before. 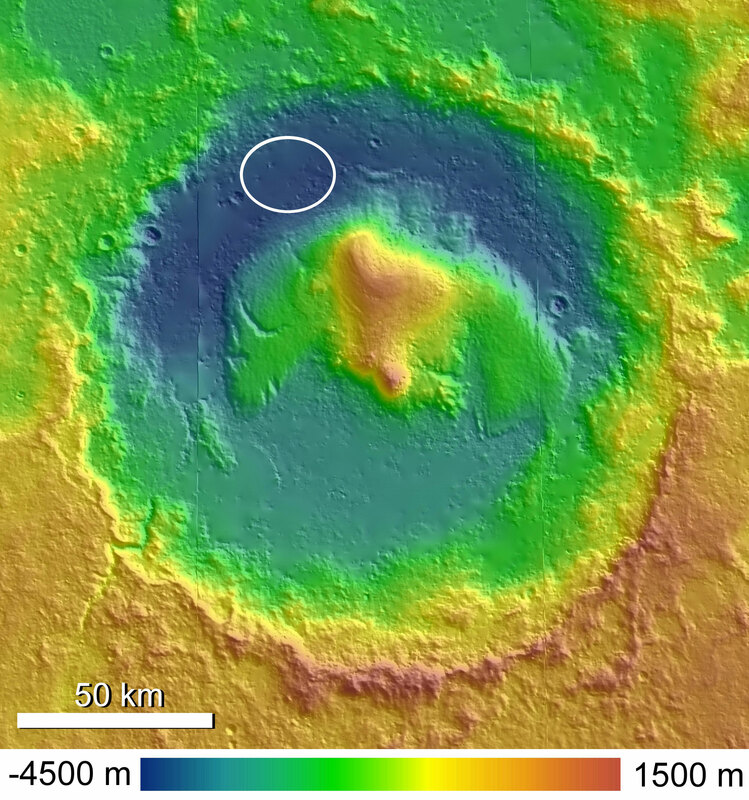 The landing site selected was Gale Crater – an impact crater, 154 km in diameter, situated on Mars’s equator at a low elevation compared to the radius of the planet – 4451m below the mean. But Gale Crater was not selected only for engineering advantages. It showed evidence from orbit of an alluvial fan flowing from its crater rim. Because it was at so low level and on the edge of a much higher surface area, it was a likely place for water to have flowed freely and pooled inside the crater walls. The new EDL (Entry, Descend and Landing) technique promised to land the rover in a landing ellipse of only 7km x 20km, near the center of the crater. So, next time you watch sci-fi movies with flying saucers, think about who are the aliens here as we are guiding flying spacecrafts through the Martian atmosphere, suspend them on jet engines above the surface and land giant rovers. Appreciate this that to launch a rocket with a rover on board from Earth and to land that same rover on Mars on the exact place that we want, with the precision we did with Curiosity, it is like throwing a basketball from New York and score a point in Los Angeles! You are probably wondering how in the world is it possible a spacecraft to land on another planet. How did it land? Mars is very far from Earth and it is not possible to send commands that the spacecraft will obey immediately. 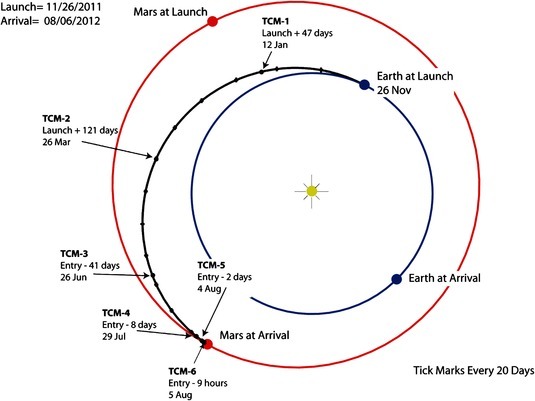 It takes 14 minutes for instructions to travel from Earth to Mars. It takes 7 minutes for the spacecraft to get from the top of the Martian atmosphere to the surface. 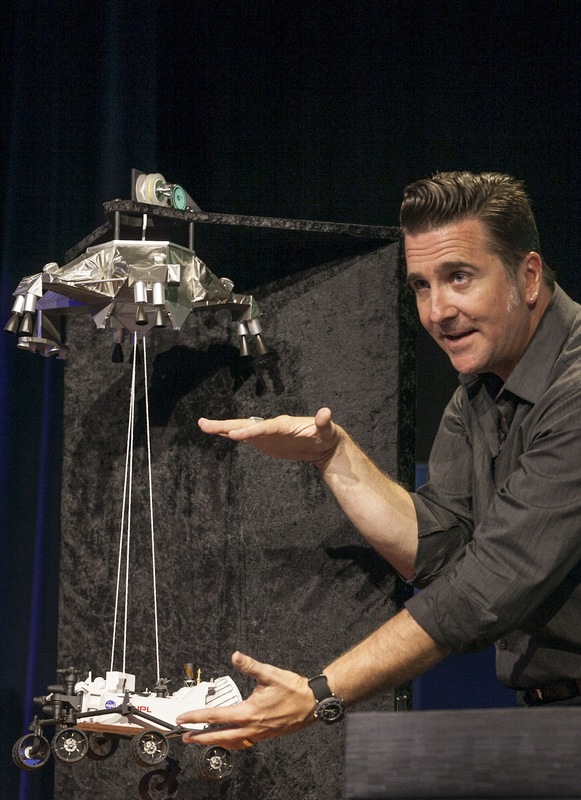 Commanding the spacecraft like this would be impossible that’s why the whole landing process is pre-programmed. The spacecraft does the whole landing by itself without any help! 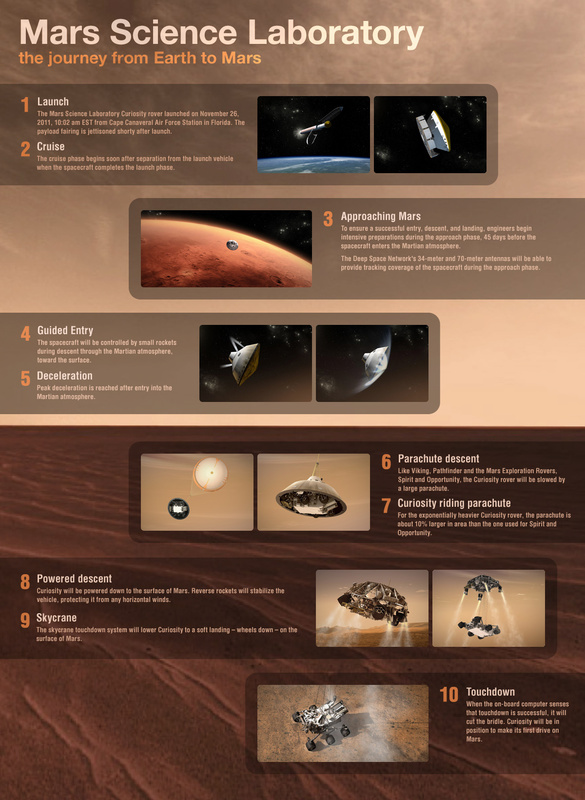 Let me tell you a little bit about the whole process of this engineering miracle to land a massive machine on Mars. First of al l, to ensure a successful landing on the Red Planet, engineers begin intensive preparations during the approach phase of the spacecraft to the planet about 45 days before we arrive at Mars. They make small trajectory corrections of the way the spacecraft is headed so they don’t miss the planet. 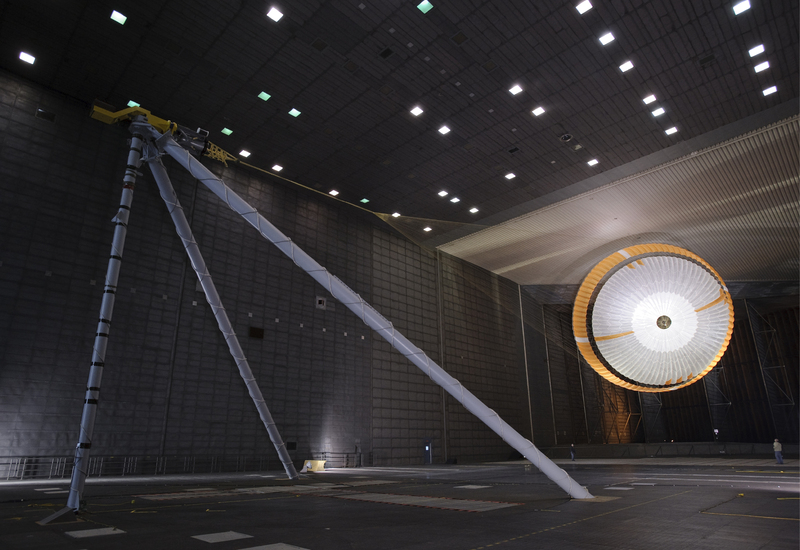 The whole spacecraft is comprised of 6 parts: 1 – a cruise stage that is used for communications during the long trip to Mars, 2 – an aeroshell which houses the parachute that will be deployed to dec elerate the spacecraft after going into the Martian atmosphere. The aeroshell also houses the two most essential parts of the whole spacecraft – the Powered Descent Vehicle and the Curiosity rover itself. 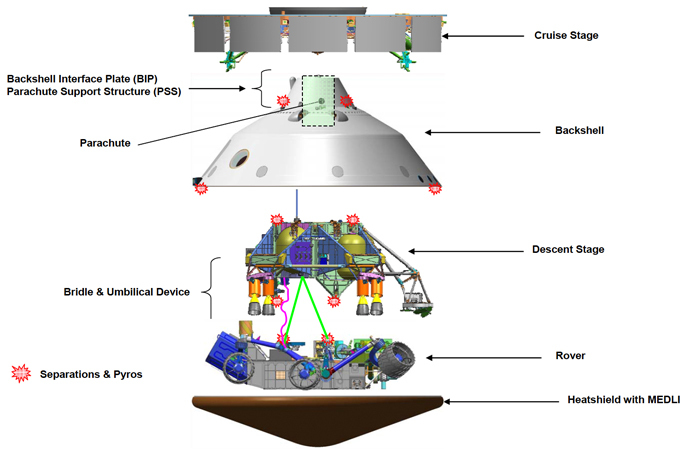 3 – The Powered Descent Vehicle will be used in the final phase of the landing when spacecraft is only 2 km above the surface of the planet and it will lower the rover gently above ground and leave it in a ready to rove condition, 4 – Curiosity is the precious gem, the only thing that would be left intact after the whole landing procedure, 5 – the heat shield will protect the rover and the descent stage while the spacecraft enters the Martian atmosphere. What happened exactly on Aug. 5, 2012? Mission control in JPL gathered in their control room and started following information that the spacecraft sends them while landing on Mars. There is nothing that they could do to prevent any disaster if anything went wrong! If they had made a mistake, it was made a long time ago! The cruise stage separates and the spacecraft enters the Martian atmosphere with a speed of 21000 km/h. It guides itself to its destination with small rockets on the back of the aeroshell while decelerating. The heat shield reaches extremely high temperatur es of 1600 degrees, but protects the precious cargo. The spacecraft slows down t o only 1700 km/h after guided entry. 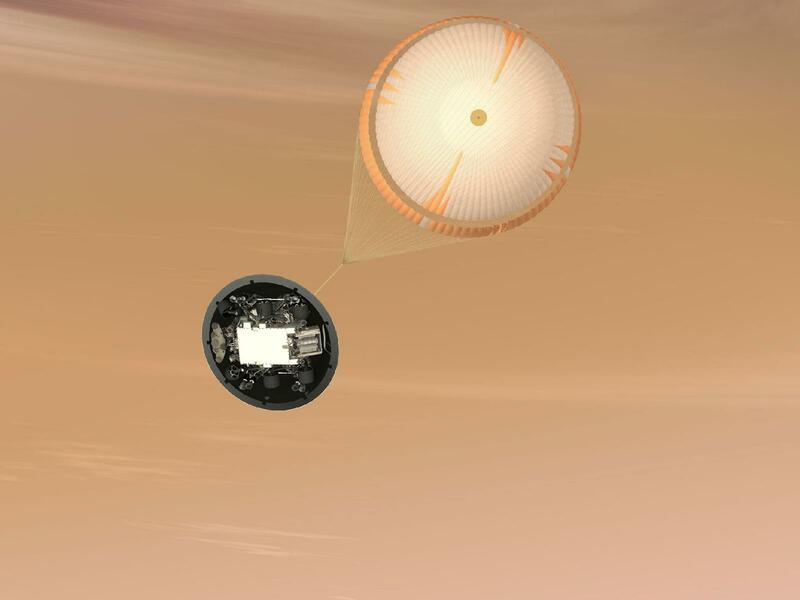 At 12 km altitude, the parachute opens and slows the spacecraft down even further. The heat shield is not needed anymore, so it is detached and falls away. A camera on the bottom of the rover starts filming the Martian surface and a radar on the Descent Stage checks how high in the sky is the aeroshell with the parachute still open. Then the Powered Descent Stage, wit h the rover attached to it, detaches from the aeroshel l and fires 8 rocket thrusters to slow down the spacecraft to just 5 km/h, and lowers itself like a giant alien flying saucer slowly 2 km above the Martian surface. 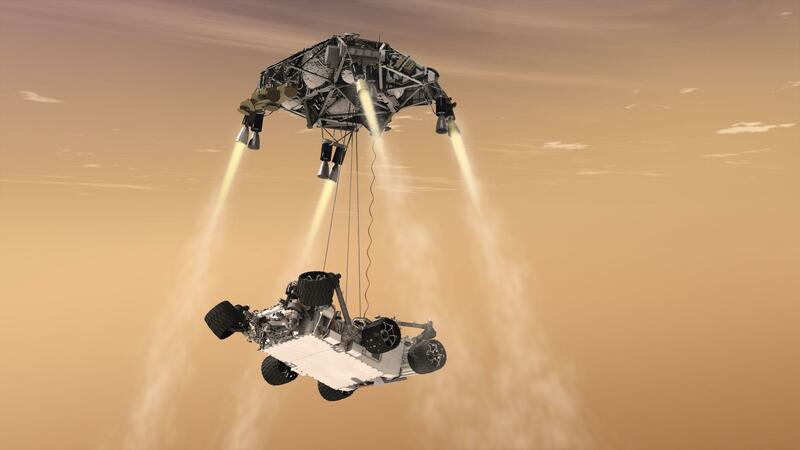 When it reaches only 8 meters above ground, a sky crane system with tethers lowers the rover to a soft landing – wheels down on the surface of Mars! The system waits a second to confirm that the rover is on a solid ground and detaches, flies away and crashes at a safe distance. Mission control at JPL on Earth receives the good news 7 minutes later. Imagine this, you are at JPL and you follow the spacecraft’s landing information and you know that it has already landed on Mars safely or crashed miserably. It already happened out there 7 minutes ago, but you receive the information late, because it needs 14 minutes for it to get to you. Humanity has a giant six-wheeled rover on Mars n ow! 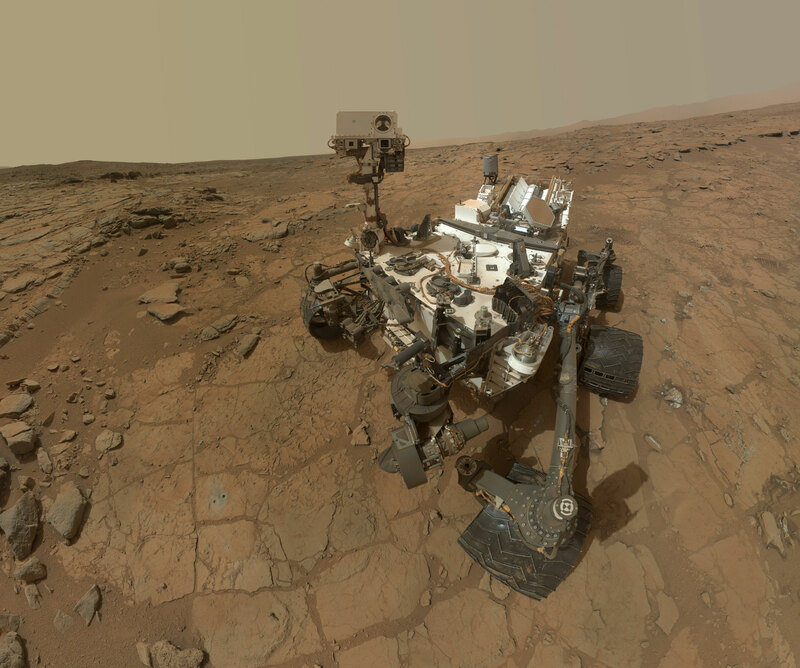 So, did Curiosity achieve its primary mission? 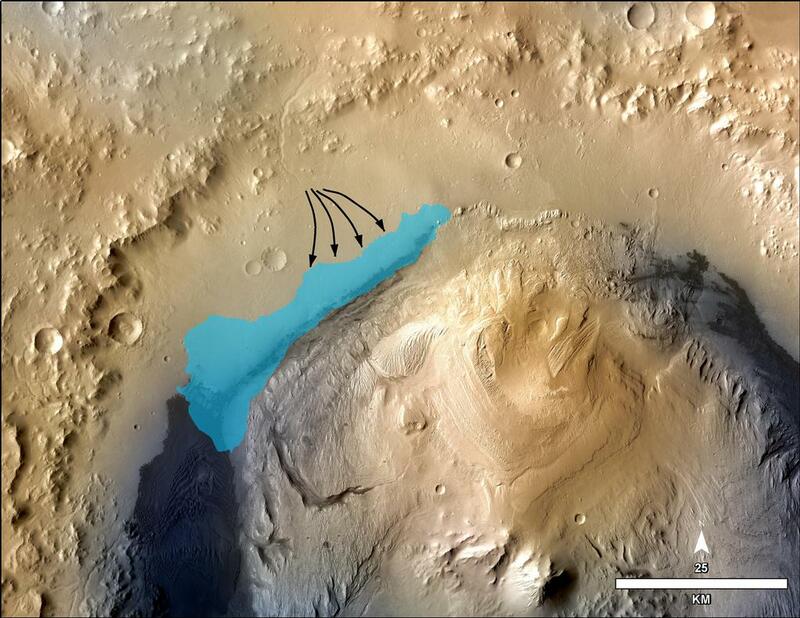 Yes, it confirmed that along time ago, Gale Crater was once a place full of water and life could have existed there. 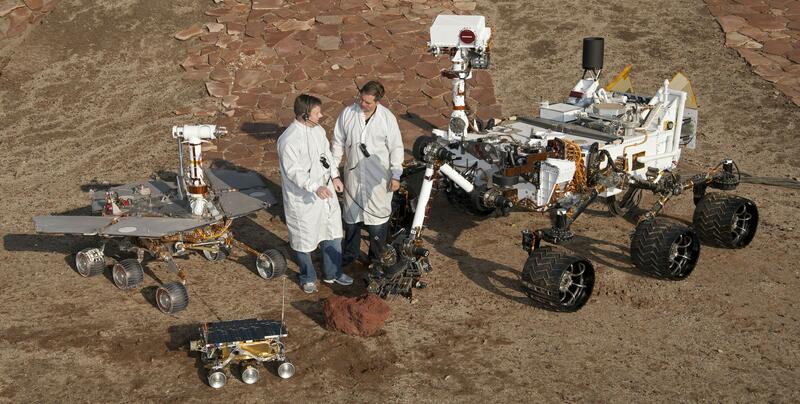 Curiosity made a revolution in planetary exploration and what is possible by human ingenuity. It continues to make big discoveries and sets the stage for boots on Mars. In the mean time, NASA is preparing the send a 2020 rover on Mars that will look much like Curiosity, but it will have a science payload to answer questions about the existence of bio signatures of past life on the Red Planet. 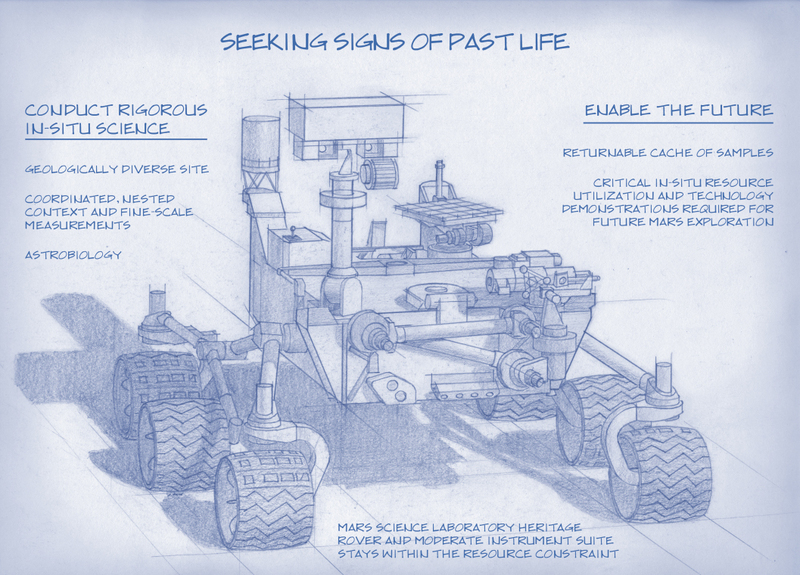 Previous PostNASA Celebrates Spirit and Opportunity’s 10 years on MarsNext PostDoes Life Need a Moon?